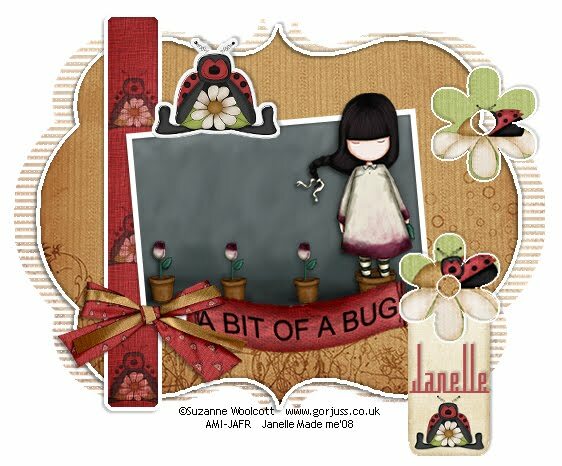 Scrapkit used is Bit of a Bug from Missy of Misfits Scrapz. With the Template open, go to Image, Canvas Size, and change the width to 570, leave the height as is. On the template cross out Missy's written layer. Save template tag as A bit of a bug. Now starting on the bottom layer, scallope shape. Use your Magic Wand tool, to click inside the shape. Layers new raster layer, Copy and paste paper as new layer, resize to suit. Selections Invert, on your paper layer hit delete on your keyboard, select none. Slice Size 2, Offset 3, Blend 50, Direction Horizontal, OK. Image resize that layer by 102%. Gap Size 1, Width 4, opacity 1, Weave Colour White, Gap Colour White, Fill Gaps Ticked, OK.
On the top example a made a white border, its up to you if you would like to have one. Selections, modify contract by 6 then hit delete on the keyboard. On the black layer5 click inside, copy and paste paper as new layer, resize to suit. Layers invert hit delete on the keyboard. Add white frame as above if desired. With your magic wand click inside the frame layer and add your image as new layer, you may need to resize and rotate this slightly. Repeat steps above for the 2 flowers, or just add some from the kit. Layout and Tutorial ©Janelle written on July 27th, 2008.